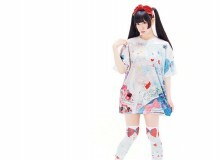 Jenny Fax, from Taiwanese designer Shueh Jen-Fang, and Mikio Sakabe’s eponymous brand are pretty much universally acknowledged as the most exciting alternative fashion brands coming out of Japan right now. Few know, however, that the two designers are actually a power couple, both working out of the same Tokyo atelier. Given the proximity of their work in real life, as well as aesthetic terms, a collaboration runway show was surely an inevitability, and this time the Tokyo fashion underground got exactly what they wanted. And want it they did, with the show having to be staged twice to accommodate the sheer number of fans who flocked to LaForet Museum in LaForet Harajuku. The catwalk was staged as a church of sorts, complete with a choir that cheered its way through the show. At the centerpiece was not a cross, but rather a small model of a contemporary two-story Japanese house. And the hymn? The instantly recognizable “Sekisui House no Uta” that anyone who has lived in Japan will know as the jingle to the Sekisui House commercials. At first, the pair seemed to want to put in the frame a conservative, peace-loving Japanese family, but it was clear that they also wanted to show the discord at the heart of these perfect family scenes. Outside the church stage, a burlesque dancer tried to grab the audience’s attention from her podium, and a team of besuited office workers staged an alternative catwalk using Cabbage Patch Kid dolls with absorbed childlike concentration. In short, it was chaos—but a chaos that was a glimpse inside the psyche of a pair who are rapidly ascending to iconic status. On the fashion itself, Jenny Fax’s output on the runway depicted a number of girly kawaii archetypes, but all with a dark twist that the designer herself referred to as “curses.” Hair brushes were stuck in her models’ hair like knives, frilly dresses looked as if they were melting, and some models walked the runway just in their underwear with their faces painted as shojo manga characters in an uncomfortable challenge to the sexualization of youth. 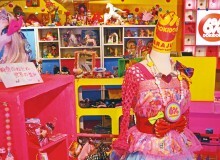 In essence, it was a trip back to the ’80s “Pink House” era of Japanese fashion, and one that echoes trends at large in Japanese mainstream fashion. Jenny Fax just wanted to show the darker side. As for Mikio Sakabe, his collection arrived without warning halfway through Jenny Fax’s runway, with him taking aim at the current transient trend-based nature of fashion. His clothes looked as if they were halfway between shifting from one garment to another, as if it was going out of fashion even as it was being worn. This theme was further echoed by the fact that he splattered the models with paint backstage just before the show in an attempt to create a moment that could never be replicated, painting over the clothes on to the body and even cementing bags to the models’ hands with viscous paint. 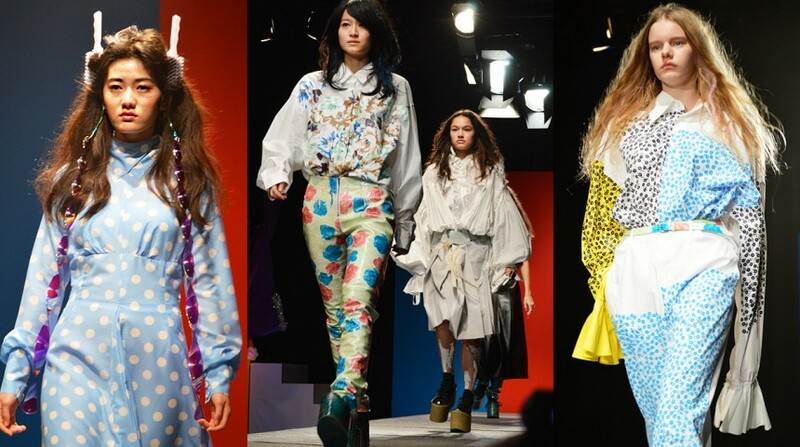 In the collection, Sakabe was asking just what has substance in fashion by presenting ensembles that were only half-finished but looked perfectly complete from the front. They were just strapped in place with elastic at the back. Perhaps the enfant terrible of Japanese fashion is accusing the industry at large of a lack of substance.